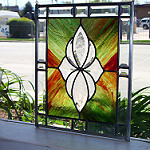 The copper foil technique is the method most used for smaller panels, sun-catchers, jewelry boxes, lamp-shades, holiday ornaments and many others. 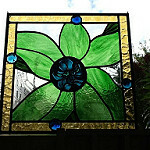 You will learn basic glass working skills including: safety, pattern prep, glass cutting, fitting, foiling and soldering. Students will complete 1 panel which is metal framed and includes a hook for hanging. Class fee includes: a project board, metal frame, chain and miscellaneous supplies. 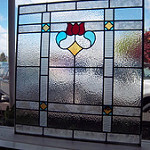 Students are required to have: Basic glass working tools, glass for the project, foil and solder. *See the required list of tools on our tools page. Required Skills: None, but previous glass cutting experience is helpful. Add a little pizazz and color to your world with a stepping stone. Stones cam be used in a variety of settings: a garden, walkway or just as a display piece. Students will choose a pattern from our library and an 8” square or 8"circular reusable mold prior to class. In class you will learn to mix your grout, reinforce the stone and weather seal it. You will also take home the reusable mold you used in class so you can create more stones on your own. Class fee includes: Pattern and mold of your choice, grout, sealer and miscellaneous other supplies. 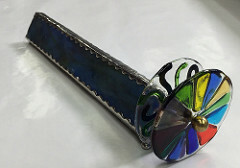 Students are required to have: Glass cutting tools, and glass of your choice to complete chosen pattern. Show your school pride with this University of Utah logo project. This class is just in time for football season but is beautiful enough to display all year long. 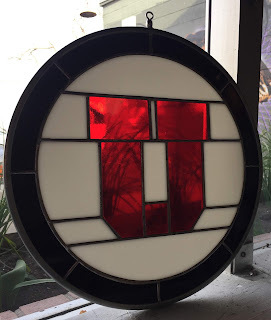 In this class you will create a circular/round shape sun-catcher with the University logo while you learn to apply a lead perimeter edge and hook for hanging. Actual size of finished project: 12 inch diameter. Class fee includes: All glass, spinning hook and lead edging. Students are required to have: Glass working tools, silver backed copper foil, flux and solder. ‘Tis the season for the perfect class for holiday gift making and décor! We only offer this workshop once a year and it fills up quickly, so don’t wait to register. This project is completed in one night using the copper foil method. No glass cutting for this project. 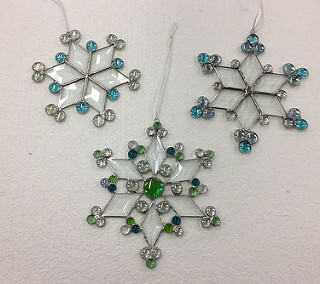 Students will create (1) snowflake in the color and configuration of their choice. Class fee includes: All glass bevels and nuggets for (1) snowflake. Students are required to have: Soldering tools, foil (silver backed recommended), flux and solder. Required Skills: Copper foil and glass cutting experience required. 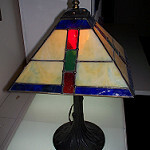 Learn how to create and assemble a panel style lamp shade. You will choose a design from the choices provided for class. This is to focus more on learning how to create and assemble a 3D project so that once you have completed the class you are ready to create your own design and to create many more lamps. These lamp shades will be created using the copper foil method. You will learn about reinforcement, assembling multiple sides of shade and how to incorporate the lamp hardware. Each student will create (1) 4-sided panel lamp and be able to learn the skills to in the future create 4 - 6 sided lamps when need or desire arises. Class is (1) night a week for 4 weeks scheduled over a 5 week span. This class and technique requires homework and besides basic glass working tools, you will also need to have a grinder at home to complete the homework to stay on track. Class fee includes reinforcement materials and the lamp cap. 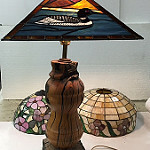 A lamp base is up to you to accommodate the finished project for a functioning lamp. This project is done in the copper foil method. 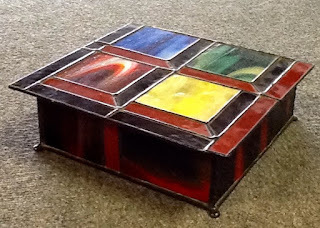 You will create your own design box lid and then learn how to accommodate in sizing to build the sides and bottom. Students may choose their own design, but must be approved before creating. This project is designed to incorporate a hinge for the box lid to be open and closed. 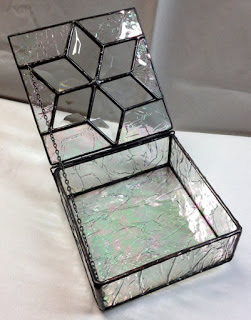 Also connecting the lid to the box you will also solder a chain to keep the box lid attached securely and safely so the box is truly functional for whatever treasures are kept inside. Class fee includes: Mirror for the box bottom, hinge and chain. Students are required to have: Glass for the lid design and sides. Basic soldering tools, solder and copper foil. Students will create a 3-sided table lamp using the copper foil method. 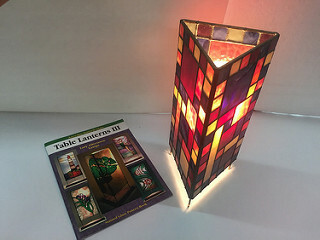 This class is formatted to use designs from the Aanraku Stained Glass ‘Table Lanterns’ pattern books. Students will need to select a pattern before the first night of class. Actual lamp size for glass is 3 sides that measure 6”width x 12” height. These are designed for ambient accent lighting, similar to a night-light effect. 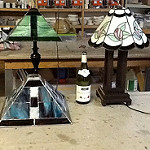 Class fee includes: Triangular wood lamp base and hardware wiring kit (inc. 40 watt bulb). Students are required to have: Glass working tools including Morton System layout add-ons, glass for project, foil, solder and flux. 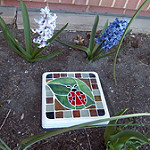 Add a little pizzazz and color to your world with a stepping stone. Stones cam be used in a variety of settings: a garden, walkway or just as a display piece. Students will choose a pattern from our library and an 8” square or circular reusable mold prior to class. In class you will learn to mix your grout, reinforce the stone and weather seal it. Required Skills: Advanced class requires copper foil experience and instructor approval. Panel- This is an Introductory panel into the Lead method by way of using a bevel cluster for the focal design aspect. Students will learn how to appropriately work with the lead technique. Pattern Prep and Design- Student Choice- Students will learn how to pattern prep the design with the cluster and learn where to apply the cut lead lines to work with creating a lead technique panel. Once the class is completed, you will have the knowledge needed to choose and complete you own future lead projects. Students are required to have: Basic glass working tools, Lead working tools, art glass to complete background, all metal caming and any additional bevels you may want to apply to your class project design.This will be determined during class week 1.